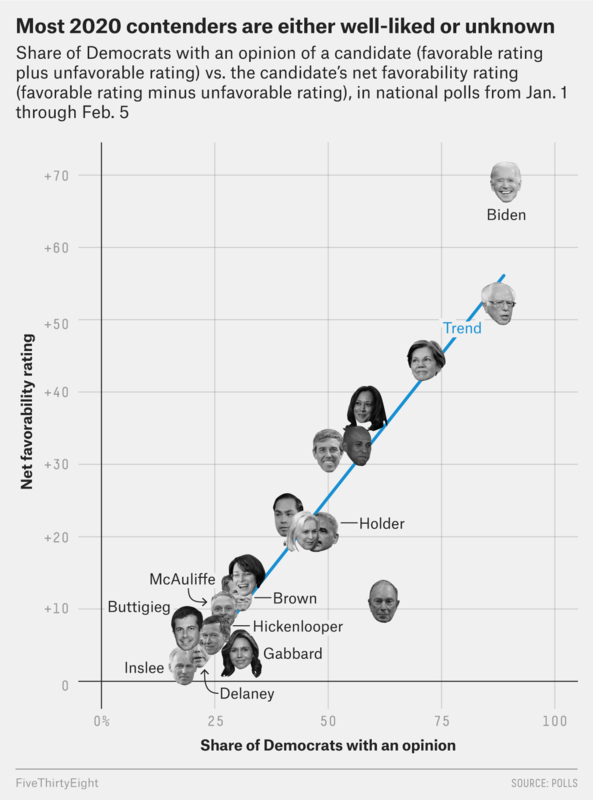 That’s also true of most major2 candidates (and potential candidates) in the 2020 Democratic field — but there is enough variation to be interesting, plus one notable outlier. Below, I’ve plotted the share of Democrats who can form an opinion of each major candidate (favorable rating plus unfavorable rating) against the candidate’s net favorability rating (favorable rating minus unfavorable rating) among Democrats,3 according to an average of national polls taken between Jan. 1 and Feb. 5 of this year. On the high-recognition end of the spectrum (the right side of the chart above), we have Joe Biden, Bernie Sanders and Elizabeth Warren. Among the three, however, Biden has the highest net favorability rating (+69 percentage points), which is higher than one would expect. By contrast, Sanders’s net favorability rating is a bit lower than what one would expect, at +52 points. Meanwhile, Warren’s +44 net favorability rating is a bit better than one would expect. As you can see, Biden is unusually beloved, even for a politician as well-known as he is. The 12-point difference between his actual net favorability rating and his projected net favorability rating places him at the top of the table. But the biggest outlier is Michael Bloomberg, who says he is still deciding whether to get into the race. With 62 percent of Democrats able to form an opinion of him, Bloomberg is one of the better-known contenders. But he has a net favorability rating of only +11 (24 points less than expected). Why is Bloomberg so relatively unpopular? Maybe Democrats are aware of his moderate views on economic issues; for example, he compared Warren’s proposal for a “wealth tax” with “non-capitalistic” Venezuela. Or, maybe, in the era of President Trump, Democrats are turned off by the idea of nominating a businessman for president. Either way, it’s a problem for Bloomberg, should he decide to run. According to FiveThirtyEight’s research, only one high-recognition but low-favorability candidate early in the campaign has overcome that handicap to win a nomination since at least 1980: Trump.4 The president may not get enough credit for his extraordinary comeback in the primary campaign5 — he turned a -42 net favorability rating among Republicans (!) in a May 2015 poll into a +28 net favorability rating that September. Bloomberg isn’t starting from such a low place, but if he wants to improve his popularity among primary voters, he may have a harder time than Trump did. Although he has the advantage of wealth (like Trump), Bloomberg is unlikely to get the massive quantity of free-media coverage that Trump did, and he doesn’t appear to scratch an unsatisfied itch for Democrats the way Trump has for the GOP. As Trump showed, net favorability isn’t the be-all and end-all of primary prognostication. But it has proved instructive in other years. As always, we continue to entertain many hypotheses about how the presidential primary works. As opposed to (3) household names who are not particularly well-liked. There’s one big (and recent) exception to this, but we’ll come to that later. Granted, this is my subjective read on the field. The analysis below excludes candidates without prior experience getting elected to office, as well as candidates who are considered unlikely to run. I was also forced to exclude some major candidates (e.g., Oregon Sen. Jeff Merkley) because there wasn’t data on them. Including voters who lean toward Democrats, where provided. A similar study we did found that, among candidates who trail in early horse-race polls, well-known candidates have worse primary track records than poorly known candidates. He probably gets too much credit, however, as a political tactician for his general election win.